Red Dead Redemption 2 is the long awaited sequel - or in this case, prequel - and has finally arrived into the patiently awaiting arms of gamers old and new. For some, this is a return to the world of Rockstar Games' Red Dead series, but not me - this is my first outing with the franchise, and it’s great that I can jump right in without having played Red Dead Revolver and Red Dead Redemption and not feel like I’m getting a curtailed experience. The game starts out in the cold American north. You’re playing as Arthur Morgan, a man in his late 40s and a senior member of the Van der Linde gang of misfits, all of whom are on the run from the government after a heist gone wrong in Blackwater. The protagonist of Red Dead Redemption also joins your party as an NPC (non-player character). 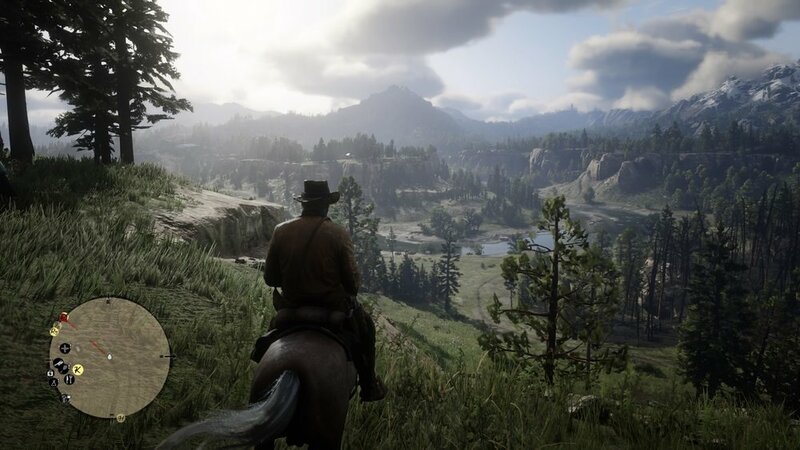 Like many previous Rockstar games, the story progresses via a series of missions set within the game’s expansive open-world, which feels complete with its own fictional states just northeast from the town of Blackwater. 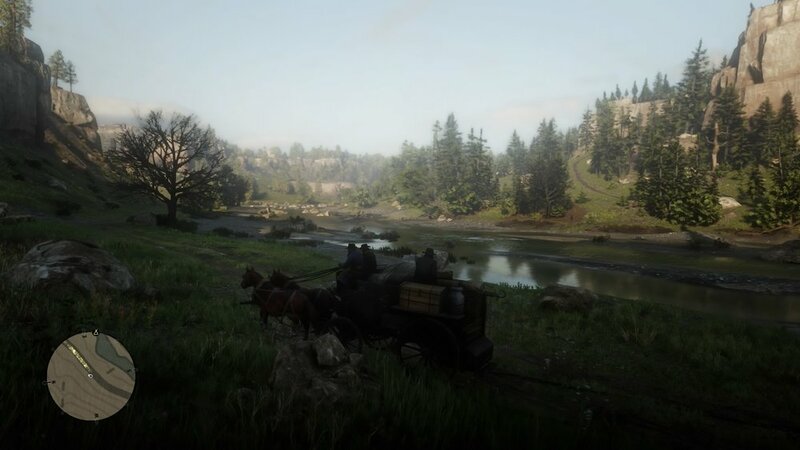 You’ll be navigating through the western territories mostly on horseback, but there are some fast travel options that you can take advantage of later on. Your trusty horses will take time to warm up to you, but when they do, they'll be your most constant companions. Familiarity and affection are important; if you haven't yet broken in your steed, you'll find yourself being bucked off its back, or worse, kicked in the face. Keeping your horses well-fed with hay and carrots, giving them the petting they deserve, and having horse revives handy will guarantee that you'll always have a friend during your travels. After several hours of gameplay, I began to really appreciate the attention to detail Rockstar had put into this title; aside from the much-discussed effects of low temperatures on male horses, it’s the innumerable little things that make this large world feel so packed and full of life. I particularly enjoy the mundane, everyday activities that make the experience richer and more strewn with realism: distributing hay for horses and brushing dirt off them, chopping wood, and moving sacks for the camp provide minor experience on your Deadeye meter as well as improving the camp's morale. A few pelts and decorations improve the camp's overall atmosphere. Crafting split-point rounds will increase the performance level of your shots versus out-of-the-box bullets. Occasional baths make sure you’re presentable at important times, and feeding yourself on a consistent basis keeps your weight within the acceptable range. All of these minor tasks make sense not only within the world of Red Dead Redemption, but also the real world. This is definitely unseen in most games where a player is left to assume that these tasks are taken care of behind the scenes. They may be tedious, and at times boring, but for me they add to the immersion and flavor of the game. Other distractions include games like Dominoes, Poker, and Five Finger Fillet, though the most worthwhile endeavor has got to be hunting. Hunting is as easy as setting out into the wilderness, roaming the map in search of the tracks of available beasts. Arthur will of course keep track of where he usually encounters such animals via the map, so you'll have a record of where to find them should you need to do so at a later time. You're going to need to study each creature, then use the right weapon to take them down. Blowing through a deer with a shotgun would riddle it with bullet holes, rendering the pelt to be of little value. Using the right weapon to take down your prey is the right way to go about things. Later on, you may also come across legendary animals you can hunt, but that’s a surprise better left unspoiled. The depth of Red Dead Redemption 2’s hunting system is outstanding, and much of its success is owed to the wildlife. There are over a hundred creatures in-game, each living within their respective ecosystems and with their own AI behaviour. You would expect a wolf to try and attack you if you smell of blood, and predict a possum to play, well, possum. It’ll lie on its side pretending to be dead if you try to chase after it. The game even gives you the prompt to pick it up and skin it, but when you do so, it scurries off into the grass to try and escape once more. These are just two examples, but all of the creatures behave as you’d expect them to in real life, and that is just going above and beyond. The Dead-Eye system returns from the first Red Dead Redemption; it lets you slow down time and pick your shots carefully before they're fired in real-time. It’s not very realistic, sure, but it’s akin to the focus described by top athletes, or the superhuman reflexes experienced by the likes of The Flash or Max Payne. 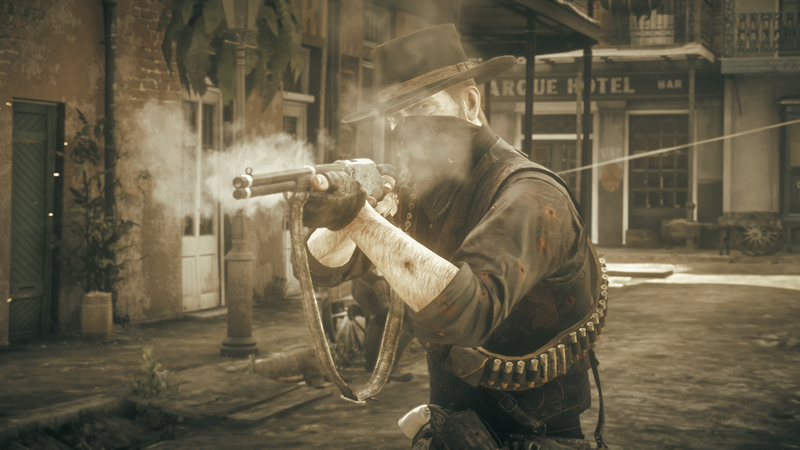 In effect, the Dead-Eye allows players a measure of strategy in combat. Classic quick-draw duels are present as well; shots can be made as Arthur fans the hammer. Emptying your barrel on all your targets is as satisfying as ever, which is sometimes necessary in hectic situations. Meanwhile, every second spent reloading or out of cover can spell defeat. Shots can be made from cover, on horseback, or out in the open. You can aim from first-person or third-person, or fire blindly from the hip. Red Dead Redemption 2 also introduces cores, a new mechanic that regulates your health, stamina, and Dead-Eye. Each core depletes passively within 90 real-world minutes and must be topped off with food, spirits, or a smoke. This adds a little bit more of a survival element to the gameplay. Once those stat bars deplete, Arthur can exert himself and deplete the cores instead, but when the health core is fully depleted, Arthur will be incapacitated. I could go on about Red Dead Redemption 2’s great mechanics, but much more can be said regarding how the gorgeous world lives and breathes. The day and night cycle’s long shadows playing upon the plains as you ride from place to place on horseback is breathtaking. Towns thrive with the hustle and bustle of people going about their daily lives, making ends meet, and doing business. Gunfights are frantic, fast, and dangerous. Animals live their own lives, as you would expect them to, and predators even hunt the smaller ones, as I witnessed on one of my hunting trips. The land is full of life and adventures just waiting to be experienced. The time and effort spent on the game is indeed present and apparent as playing through at a slow pace feels rewarding, not to mention how random events add to the beauty of adventure within the land. Even after eighty-five hours of play, i'm still discovering new things. The mundaneness and normality of everyday tasks aren’t something I associate with modern action games, but everything is done with deliberate purpose, and all of the various systems synergize into an enriching experience that outshines any minor inconveniences. Chopping wood or carrying a sack of grain across the camp will take time, and that's definitely how you should be playing this game anyway - getting to know the people and the land, as well as drinking up all the scenery. Between the touches of realism and the wildlife AI, it’s quite an achievement how much life Red Dead Redemption 2 breathes into the wilderness. The wild west ride isn’t all smooth; there’s still a few things that have definitely ruffled my feathers. Whenever I dismount from my horse, the weapons I'm equipped with are sometimes left on my horse's saddle. This is rather inconvenient to discover when you're in the middle of a gunfight with only your sidearms. Another gripe - there’s a lack of ways to sell or keep your guns at camp, forcing you to cycle through them when picking via the weapon wheel. Then there’s the hostility and aggression shown by some NPCs - it's a bit unforgiving if people suddenly get annoyed with you during your adventures. Simply bumping to them and knocking them over is likely to get the lawmen noticing you right away unless you apologize. Even standing beside a person for too long gets on their nerves and antagonizes them, if not outright provoking them. Defending yourself when the NPC shoots first is also out of the question since you’ll end up being saddled with the blame. But all of that’s extremely minor when held up to how good the game is. Overall, Red Dead Redemption 2 does a really good job at keeping you busy, and you’re rewarded even if you just wander throughout the vast wilderness and experience the random events. The tight gameplay and the seemingly limitless activities possible in the world make each hour a worthwhile endeavor, whether it be fighting off bandits to rescue someone, or killing off bounty hunters or lawmen to cause some havoc. The large amount of freedom you're given sets the tone for how you want to play as Arthur, not just from a gameplay standpoint, but in a moral sense. Arthur is probably my favorite protagonist of any Rockstar game, and this enriching and rewarding title truly did not disappoint. Since Red Dead Redemption hasn't gotten a PS4 port or a remaster, here's hoping an expansion for John Marston's story is released as DLC in order to make it a truly complete experience.